NATURAL HABITAT AND PREFERRED SITE: Far East Texas and other deep, sandy, acid soil areas. 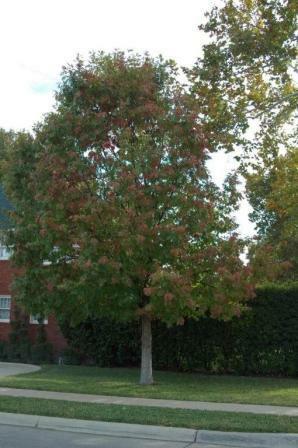 IDENTIFICATION INFORMATION: White oak is a large, gorgeous tree with beautiful summer foliage and excellent red fall color. FLOWERS AND FRUIT: Typical oak, monoecious, male and female separate plants but on same tree. Male flowers have long, hairy catkins in the early spring. Female catkins are shorter. Shiny tan to dark brown, 1-inch acorns are the fall forming fruit. BARK: Light gray to reddish brown developing into shallow fissures with age. Light color even at maturity. FOLIAGE: White oak has my favorite tree foliage. Leaves are deeply cut, rounded on the edges, beautiful red fall color. They are alternate, simple, deciduous, 5 to 9 inches long, 7 to 11 lobes. Tends to hold its leaves well into the winter. Some people consider this a maintenance problem. 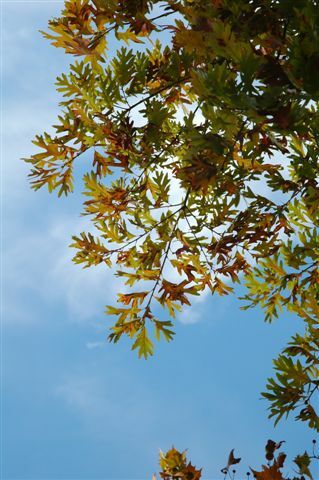 Summer foliage color is deep green to slightly blue green, fall color will range from wine red to orange red. 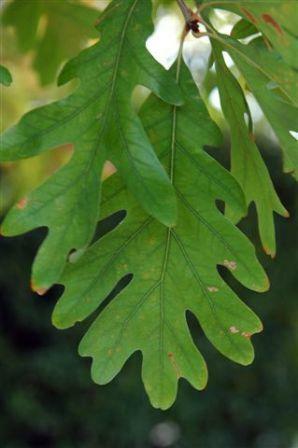 CULTURE: White oak is easy to grow in acidic to neutral soils, fairly drought tolerant and requires little fertilizer. PROBLEMS: Unfortunately, this tree will not grow adequately in the black and white soils of North and Central Texas. It must have deep neutral to acid sandy loam. PROPAGATION: From acorns planted immediately after they are released and still fresh in the fall. White oak is difficult to transplant due to its deep taproot that develops early on young seedlings. INSIGHT: White oak is used often for its lumber and for making wine and other wooden barrels. White oak is without doubt one of our state’s most beautiful trees. Wood is heavy, hard, durable used to make railroad ties and flooring. It is also used for firewood and boat building. It has an attractive grain. Gamble oak, Q. gambellii is a strong look-alike but grows in alkaline and blackland soils. It is smaller, 15-25 feet, and native to the mountains of the Trans-Pecos.